New archaeological findings in Albania, shows that this country is rich in history and still unexplored. As a new pipeline cuts its way through the Balkans, archaeologists in Albania are grabbing every opportunity to expose the country’s history, from the Neolithic to the present, - writes Archaeology magazine in a new article which also featured on the cover of January/February 2018 issue: “The head of a bronze figurine identified as Zeus from Apollonia, Albania”. In modern Albania, the mélange of historical cultures is packed so densely they often seem to collide. 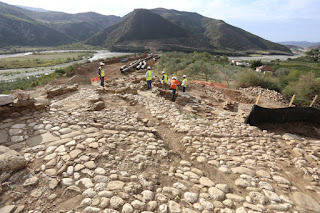 The national E852 highway follows the same bank of the Shkumbin River as an ancient highway, the Via Egnatia, which was first traveled by Roman soldiers around 200 b.c. The road was modernized and maintained for centuries thereafter, and it became the main thoroughfare between Constantinople and the Adriatic, facilitating communication and trade between Rome and the eastern lands of the empire. Today, luxury Mercedes swerve between transcontinental bicyclists taking in the lush Mediterranean landscape and donkey carts hauling towering piles of forage. The route winds gently past medieval Ottoman Turkish bridges and white obelisks from the Communist era immortalizing partisan battles fought during World War II. Scrappy tobacco fields and mounds of hay and cornstalks line the route, planted and stacked by hand, much as they have been for centuries.